WILD ABOUT HARRY: Was Collins Hardeen's Kukol? Recently our friend Bill Mullins discovered Jim Collins' obituary in Variety for March 11, 1942 (p 54). It's not a long obit, but it contains a bombshell bit of information in regards to when and how the all-importnat Jim Collins came into Houdini's world. James Collins, 60, assistant for many years to the late Harry Houdini, died Friday (6) in the Philadelphia General Hospital, Philadelphia. At his bedside was Hardeen, Houdini's brother, with whom Collins was appearing in 'Hellzapoppin,' which wound up a long stay in Philadelphia last week. Collins suffered a heart attack last week. He began his career as a magician's assistant in 1902, when he answered an ad in a London newspaper placed by Hardeen. He later shifted to Houdini, with whom he worked until 1926, and was credited with inventing several illusions used by both magicians. He is survived by his widow. So the thing that immedialty jumps out at me is the information that Collins started working for Hardeen in 1902. I don't believe I've ever heard that! Most biographies say Collins came into Houdini's life around the time of the Milk Can. Gresham says Collins was hired in 1908, but Christopher in Houdini The Untold Story says Collins signed his assistant's oath with Houdini on December 3, 1910. It's been said Collins, who had carpentry skills, was hired specifically to build the Double Fold Death Defying box. But if we are to believe Variety, Collins had been Hardeen's assistant for some eight years before he went to work for Houdini. As Hardeen's act was mirror of Houdini's -- right down to his own Bess in "Miss Trixy" (who left the act in 1905) -- this makes Jim Collins Hardeen's own version of Franz Kukol (Houdini's chief assistant during his Handcuff King days). Now, I admit I've not tried very hard to confirm or refute this. I'm taking Variety at its word. But it is amusing to think that Harry not only snatched Bess from his younger brother, but also Jim! Collins once again went to work for Hardeen following Houdini's death in 1926. At the time of his own death, he clocked an amazing 40 years with the Brothers Houdini. Wow! Very interesting find indeed. 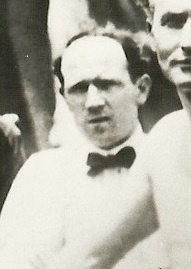 Hardeen played Europe (England, Ireland, Scotland and Wales) for seven solid years after Houdini first booked him as his own competitor in Germany. So, I guess it is possible he worked for Hardeen in 1902 and then Houdini hired him in 1908. What does Mr. Culliton think? There we go. That Jon Oliver has the goods. Although it was right here in Variety for all to see. How did this go undiscovered, or at least unrecorded, for so long? It's not like Variety is an obscure publication. Thanks again to Bill Mullins. He's got the goods too! And also, this is something Harry wouldn't have been telling people. It makes sense that Collins would have started with Hardeen and later gravitate to HH. He knew HH was the brains of the outfit and would provide a better, more profitable career for him. That jives with the above. Collins started with Hardeen then moved to HH around 1908-10.